Sometimes dashboard builders make the mistake of including charts for the sole purpose of being visually impressive, while not serving a specific practical purpose. One of these overly used techniques is to make dashboard charts 3-dimensional. While they may look good, most of the time they are placed into dashboards without thinking about usability. This article will discuss why three-dimensional charts often sacrifice clarity of data for good looks, and how you can actually use these charts smartly and sparingly to wow your audience in a good way! Dashboards and visual data reports are seen by some people as having inherent flaws (which this article of mine has tried to address). To recap, these perceived flaws focus mostly on the idea of ‘style over substance’, a reputation I find is largely down to misuse of the various chart types available. Sadly, using a 3-dimensional version of a chart in a dashboard feeds this notion, as nine times out of ten, it is done in an attempt to impress viewers through spectacle. While there’s usually no harm in drawing attention to charts which contain very important information, making a chart 3d can actually hide this information if used recklessly. Here are the reasons why. 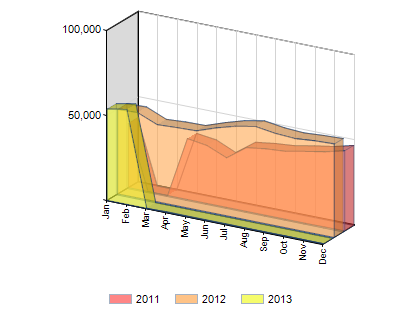 The main issue with 3d dashboard charts are that they are easy to misread if you need accurate information on values. 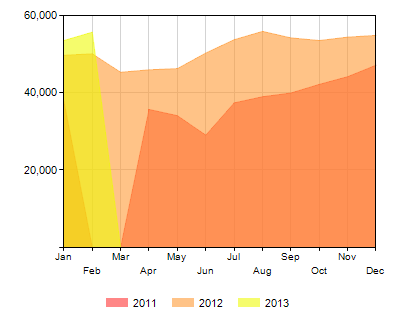 When a chart is made 3d, the user’s view of the chart is usually slanted. 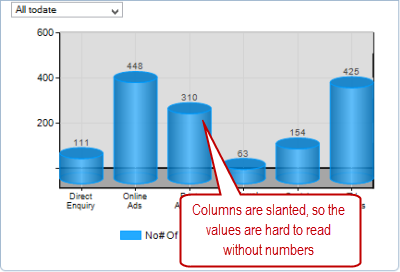 Let’s take a look at this column chart. If you don’t slant the viewpoint, you can’t see the 3d effect. But, in doing this you effectively get two values in the column which can be read: the front end of each column, and the back end of the column. This holds true for any time-based chart, and obscures values which don’t fall on a marked interval on the Y-axis. Also, because the values are obscured, it is a lot harder to compare values to each other and reveal accurate trend information. Usually, when selecting one chart type over another, there are advantages and disadvantages to each choice. 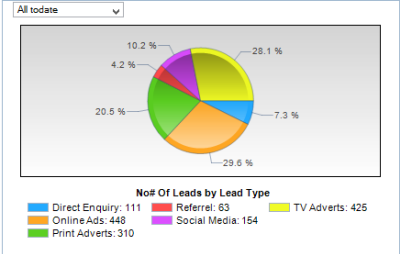 For example, when selecting a pie chart over a column chart to show categorical data, you might choose the former because you want to see the parts to whole relationship between each category item. For data visualisations and dashboards, both of these points don’t really offer an advantage. Take this pie chart, for instance. It presents the same part-to-whole relationship, no matter where you look on the chart. Here is the same chart in 3d. Here, no matter how you flip the chart, or what angle you look at it from, the information is also the same. However, as I described earlier, the chart is seen at an angle, and is actually detrimental in this case as the exact size of each segment is more difficult to see here. The perspective and depth of the information of your charts comes from the different ways which you present the information, not the minute details within a single chart. Therefore, the detail which you would usually get from making something 3D is lost. 2. How to use 3D charts in your Dashboards. While it may be tempting to use 3D dashboard charts to add some impressive visuals to your dashboards, most of the time these can actually be detrimental to your dashboard. 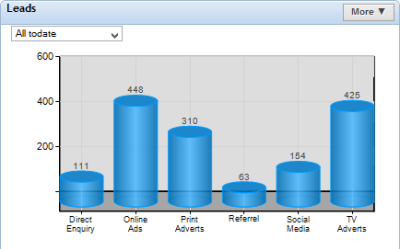 However, all dashboard chart types can help users, when used correctly. Thinking back to what we’ve talked about with the advantages of 3d objects, there is a particular chart type which 3d adds emphasis to: a yearly comparison chart. This is because comparison charts contain different trend lines which are related. This means that it is important to compare the overall shape of every trend line on the chart, as in this area chart. If there is an overlap of the trendlines of each year, it may help to make the chart 3d and turn it to the side, in order to see past the block colours of the area chart. 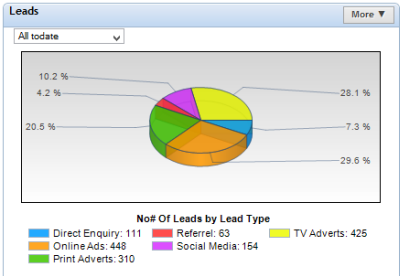 In a dashboard program like Target Dashboard, you change a chart to 3D and tilt it in just a few clicks! Here, you can see each trend line clearly, especially how each compares to the other. Though the values are still difficult to read, this doesn’t matter if the main thing you want to see from the chart is the trend information. Another use for a 3d chart is to emphasise important information. Following on from my previous blog on why two charts are often better than one, adding a 3d chart as an auxiliary chart can bring attention to noteworthy trends or values comparisons (NOT individual values). Much like gauges, the simple fact about 3D charts is that they are ‘eye candy’ – people will pay attention to them. Therefore, if you supplement regular KPI charts with 3D counterparts, they can function to draw attention to important information. Use 3D sparingly, and it can attract attention for the right reasons! Though 3D charts have been used just to make dashboards visually splendid, these charts often dilute the information which is being presented, due to reduced readability. But, by learning what 3D can and cannot do, you can either use it to your advantage, or choose a more appropriate chart type. Though I view 3D graphs as not incredibly useful, they can still serve a dashboard well if their use is well thought out. See our 3D charts for yourself with a free demonstration. Take a look at our best practice guide for more tips on dashboard design, 3D or not 3D!